Cross-Straits economic cooperation has a solid foundation and strong driving force, China's top political adviser, Wang Yang, said on Tuesday, calling for closer cooperation among companies across the Taiwan Straits to achieve mutual benefits. Wang, a member of the Standing Committee of the Political Bureau of the Communist Party of China Central Committee and chairman of the Chinese People's Political Consultative Conference National Committee, addressed the opening ceremony of the Cross-Straits Entrepreneurs Summit in Xiamen, Fujian province, on Tuesday. He said the world situation has been complex and uncertain this year, with protectionism and unilateralism on the rise, but trade volume across the Taiwan Straits has stood the test and increased. The mainland and the island have their respective strengths in funding, markets, technology and human resources, he added, and the trend of economic complementarity of the two sides remains unchanged. Wang said the mainland's economy has shifted from a stage of rapid growth to a stage of high-quality development, and there is a growing demand for quality products and services from Taiwan. "The mainland's policy orientation of providing good services to Taiwan businesses is consistent," he said, adding that, "The door of opening up to Taiwan will get wider and the policies and services will get better". Wang stressed that a peaceful and stable environment is the prerequisite for development and cooperation. He reiterated that compatriots on both sides should join hands, adhere to the 1992 Consensus on the one-China principle, and resolutely oppose "Taiwan independence". Wu Chia-ying, president of the Taiwan Businessmen Association in Xiamen, said the summit has a meaningful historical background, because this year marks the 40th anniversary of the mainland's reform and openingup, to which Taiwan businessmen contributed a lot. He said Wang's speech showed that both the trend of cross-Straits business cooperation and the mainland's stance of giving favorable policies for Taiwan companies remain unchanged, reflecting Taiwan businesses' expectations. Businessmen on both sides should complement each other in industrial advantages to promote the prosperity of the country's economy, he added. 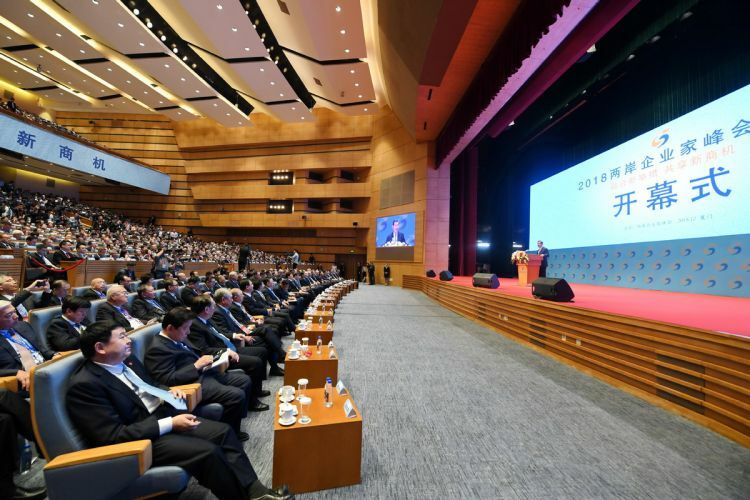 Su Shih-chung, secretary-general of Taiwan Angel Club, an investment association based in Taipei, said Wang's speech showed that technical cooperation by companies on both sides will become a trend as the mainland promotes indigenous innovation. "Taiwan's industrial scale is relatively small, but it has some technological strengths that can be shared with the mainland, and the summit provides a platform for companies to form deeper cooperation," he said. The annual summit was launched in 2013 as a grassroots platform for business communication and exchange across the Straits. About 1,000 business executives and heads of business organizations participated in the event.